The one above used Country Life. I used the Cricut Craft Room to extend her pant legs and make boots from her previously bare feet. I hand cut her jacket, trimmed her previously long hair, and added a leash. Her dog, Sneaker, loves to wear bandanas and go for walks. The flower is from the Flower Shoppe and is inked with Copics and Sneaker’s “boots” were inked with a white Uni-ball Signo pen. 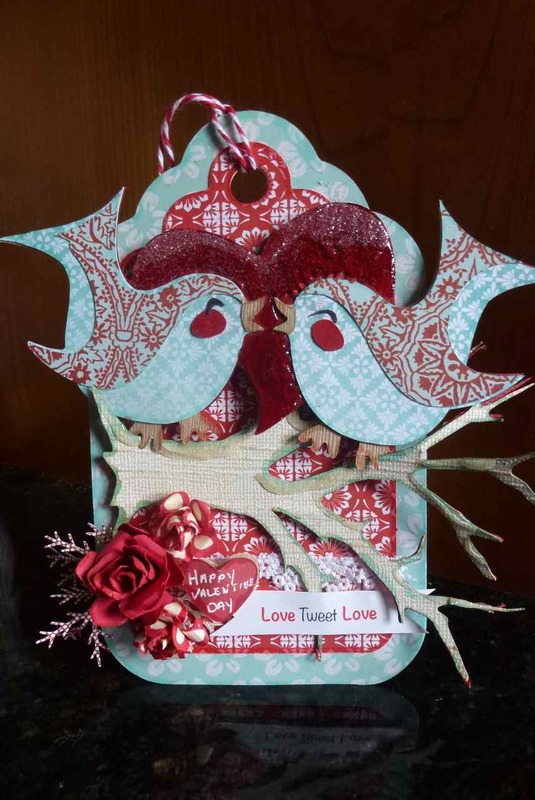 The tag is from Winter Frolic and the red cardstock is embossed with a rose pattern from Lifestyle Crafts. It was inked with Barn Door Distress Ink to bring out more of the dimension. I have to say, I really love how this turned out. I hope my friend does too. 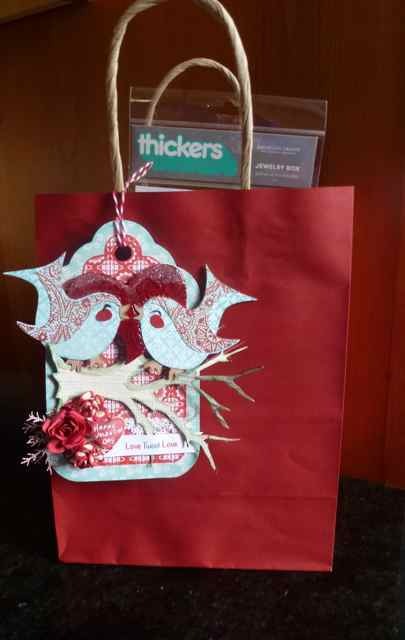 The one below used Something to Celebrate for the birds with their heart and I used the same embossing folder as the previous tag. I inked it and added glossy accents and glitter. This is the same Winter Frolic tag. The branch is the “tree” from Paper Doll dress up turned sideways. There is a lot of pattern and glitter on this tag – aqua and red is one of the recipient’s favorite color combos (and mine too). The roses were made from the Mother’s Day Bouquet cartridge. I wrote the Happy Valentine Day (couldn’t fit the ‘s) on the heart as my friend loves those conversation hearts (that I couldn’t find anywhere)….And although it is very different than the tag above, I really love this one too! 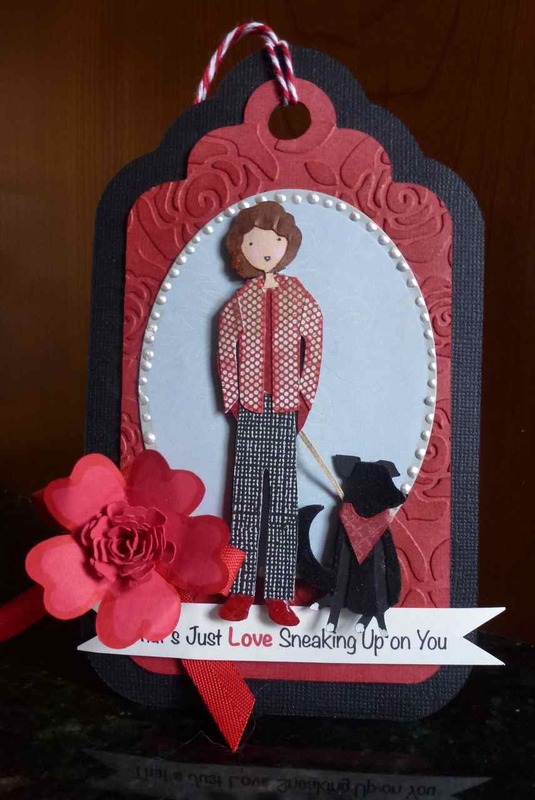 Both tags include an Tim Holtz easel stand so the recipients can stand them up if they choose. Wherever you are today, I hope your day is sweet! Two wonderful tags! Love both of them, but Sneaker is especially marvelous!! Works of art. First, let’s talk about that dog. OMGosh, Sis! How perfect and fun is that guy!? I think the bandana did me in! Perfect with the embossing, the colors, the mini prints! Love the flowers too! Wow- the second one needs to be framed. You are a genius with pattern. This tag reads like a collage with so much energy. Perfect flowers, the extended branch, coordinated colors and prints. Just so much fun to look at. 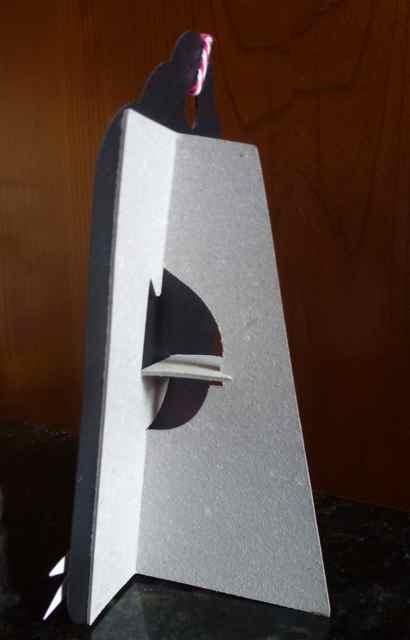 I am sure your friends will use the easels because they are so lovely – pun not intended. Happy Valentine’s Day and thank you for this wonderful visual candy! Absolutely gorgeous tags!!! Sneaker is too cute! The birds on the second one are just adorable. Love both tags!!!! Love all of your details! And Happy Valentines Day ! Super cute tags! Love the little dog and sweet birds! These tags are outrageously gorgeous!!! I adore lumpy bumpy projects, so the dimension on these is divine!!!! Thank you so much for your kind words on my blog…..your visits mean the world to me!